These are your 3-Wheeler Projects. 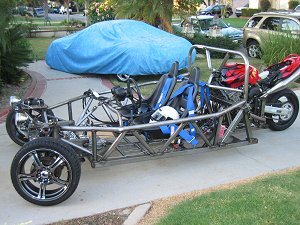 Welcome to the 3-wheeler Projects Gallery of your home made 3-wheelers. From Owner's Gallery 160 all home made 3-wheelers will now be entered into the Projects Gallery. If you would like to see your project on this web site please e-mail me a picture and I will include it. The newest addition to the Gallery will always appear first moving older images to the end.